Early Friday (Oct. 12), Virginia State Police Aviation and Search and Recovery Team divers returned to Mt. Harmony Road to assist the Charlotte County Sheriff’s Office with ongoing search efforts for a missing motorist. At 7:28 p.m. Thursday, state police responded to assist the Charlotte County Sheriff’s Office with a vehicle stranded in high water on a bridge along Mt. Harmony Road. The vehicle had three occupants who were clinging to the bridge railings. The Charlotte County Sheriff’s Office was able to pull one of the occupants, a 17-year-old male, to safety. The other two, adult occupants were swept away in the rushing floodwaters before the deputies could reach them. Overnight the remains of the adult male were recovered. The search continues now for the adult female. In the Mt. 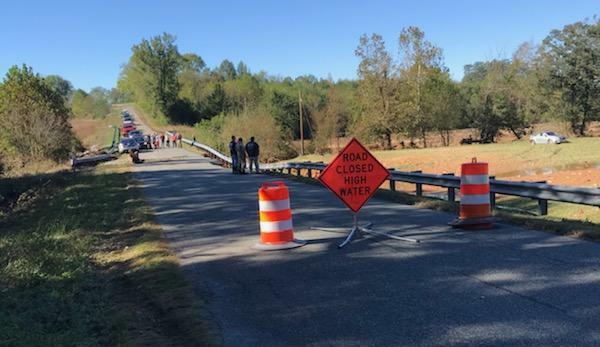 Hermon community of Pittsylvania County, Virginia State Police responded to help locate James E. King Jr., 45, of Dry Fork, Va., who was swept away from his vehicle. His vehicle got caught in a flash flood in the 600 block of Sandy Creek Road around 3:30 p.m. Thursday (Oct. 11). Despite the valiant efforts of a Pittsylvania County Sheriff’s Deputy and a local resident to rescue King, the floodwaters were too deep and too swift for them to maintain contact with him. At approximately 10:37 p.m., Special Agents with the Virginia State Police Bureau of Criminal Investigation and local volunteer firefighters located King’s remains downstream. The Office of the Chief Medical Examiner has ruled the death of a Hanover County firefighter as related to Tropical Storm Michael. In Hanover County, at approximately 9 p.m., the Hanover County Fire & EMS had stopped at a crash scene on I-295 to render aid to those involved in a two-vehicle crash. The fire engine had its emergency lights activated while stopped in the far left lane and shoulder. A southbound tractor-trailer rear-ended the fire engine and struck four firefighters who were outside the fire engine. One of the firefighters, Bradford Clark, 43, of Mechanicsville, Va., succumbed to his injuries at the scene. Two other firefighters were transported to VCU Medical Center for treatment of life-threatening injuries. A fourth firefighter suffered minor injuries and was treated at the scene. The driver of the tractor-trailer, Lester Labarge, 49, of California, Md., was also transported for treatment of serious injuries. He has been charged with reckless driving and was cited for defective brakes. The crash remains under investigation and additional charges are pending. City of Danville – 2 Confirmed Deaths – Please contact the Danville Police Department for information.